It’s been two weeks since my last blog post, and the amount of progress I have made since then is really astonishing. As I start to understand more and more of the C# scripts and the fruits of my labor start coming together, Unity is getting more and more fascinating. 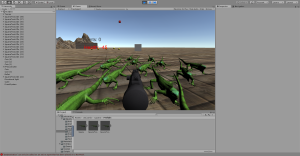 I initially knew that Unity had been a powerful game engine, but the amount of things it automates blows my expectations, and learning a new programming language is also very interesting. We had originally planned to have the session on February 23rd, but we had to reschedule to February 24th after the inclement weather. This didn’t affect the length or quality of our session, however, as we still managed to cover assets, and how to create a basic script for an asset downloaded from the asset store. These assets make interesting game objects, and I found just experimenting with different assets amusing, as I could quite literally make anything in my game into anything I could find in the asset store, whether it be a goat or an iguana. Alright Jerome, answer the questions now. What has been my most difficult mentoring challenge so far? Why? My most difficult mentoring challenge so far is remembering and incorporating all the C# scripts Rafael teaches me. There are tons of different C# functions and codes, and I find that just trying to remember which ones are a class, a function, or a variable is really proving to be a challenge for me. I can usually find the right code when I need to perform a certain task in Unity, but occasionally, I don’t know the format or which code I need to use. Rafael is great at teaching the material, but he goes over the C# scripts really quickly, as we simply don’t have the time to explain every single code that we type. Weeks of classes are being crammed into a single session due to the accelerated nature of our sessions, so writing down the material I learned and going over it over the two weeks I have between our sessions should prove to be effective. What is working well? Why? Our progress is going really well. We are covering weeks of material in single classes. Rafael said that we are currently covering materials that he learned when he took weeks of Unity classes. It’s astonishing to think that just a few months back, I had no idea how Unity even worked, and now I’m already creating scripts and creating the rudimentary foundations of my game. Additionally, our communication is excellent. We communicate effectively during mentoring sessions, and when I need Rafael’s assistance when we are not having a session, I can always reach him through phone or e-mail. What could be working better? How can you make sure this happens? Now that I have a grasp of how Unity works and how much time is needed to learn the material, I can update my schedule and start setting goals between each of our sessions. My schedule, which I created before I had even touched Unity, doesn’t really make much sense now, and by setting goals between each session, I will be able to process and comprehend everything Rafael is teaching me. With every week bringing new challenges, In-Depth has had its share of ups and downs, but the excitement of seeing the different pieces coming together and creating my goal of an original game is making it a thrilling experience! You are finding effective ways to make good use of your sessions together. How far along are you with the programming of your game? What are you doing to make sure your communication is effective during your sessions?